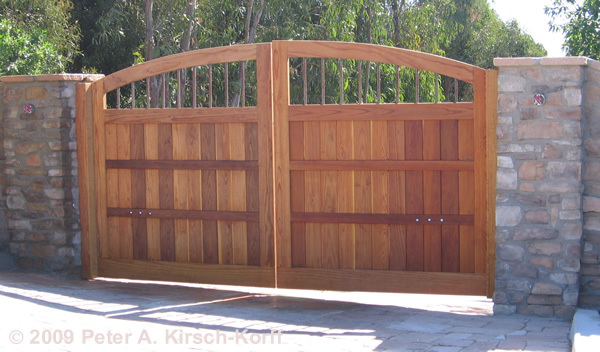 Looking for a beautiful wood driveway or entry gate? 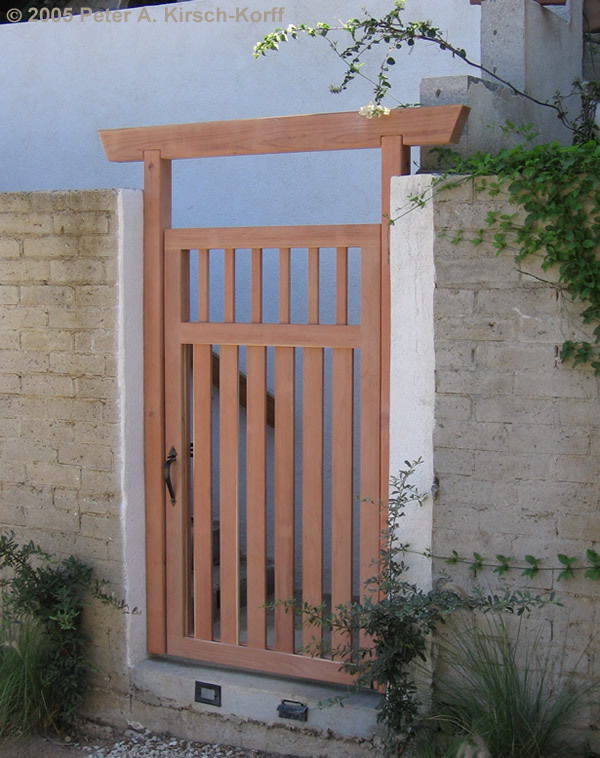 I design and build custom gates that reflect the architectural style of your home, whether you have a Spanish Colonial, a Mediterranean villa, a Craftsman style home, or an English garden cottage. I focus on building structures that are not only beautiful, but excellent value for the money and built to last. 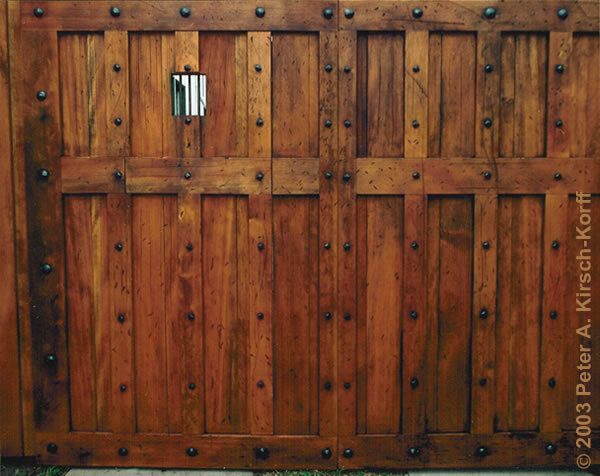 The right craftsmanship, building techniques and materials make all the difference in whether your wood gate will last 5, 10 or 15 years. That is one of the reasons why I do all the work myself, so I can control the quality of construction and you don't have to deal with crews of workmen you have never met. My clients also hate having construction start and stop and stretch out for weeks, so I build for one homeowner at a time and stay on your project until it is done - usually completing most projects in one to two weeks. And I create a unique design for each client which reflects the unique look and feel of your home and garden. 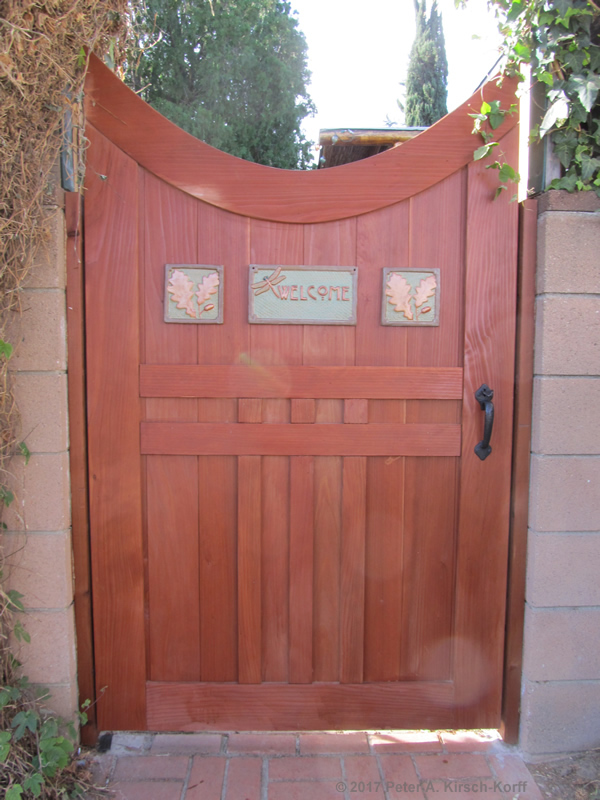 Below is my portfolio of wooden gate photos, as well as pricing for gates in the Los Angeles area and a detailed gate design guide. 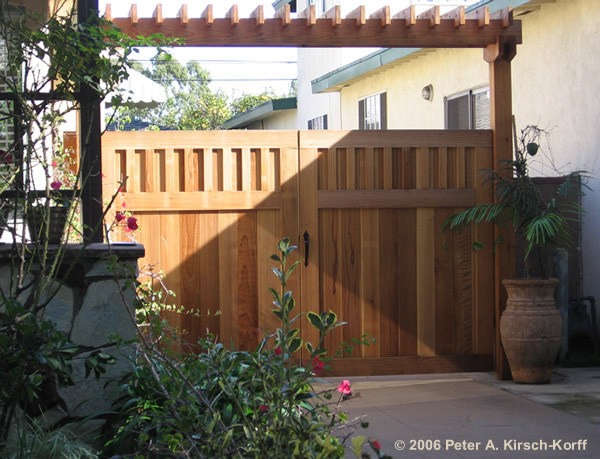 I hope these will help you find the right builder and design a gate you will enjoy for years to come. 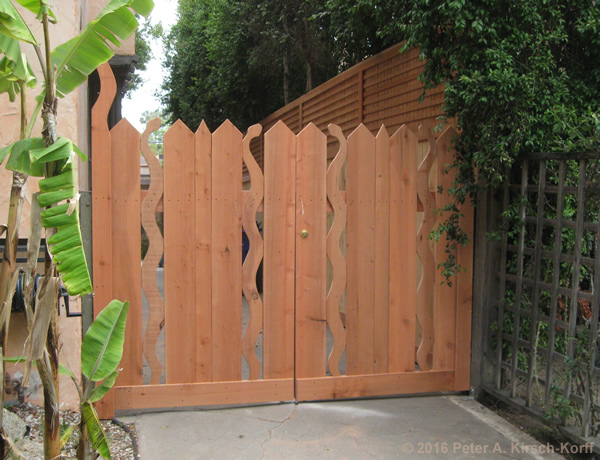 For workmen and companies that do gate repairs, build basic gates, or install automatic gates, see my related links. 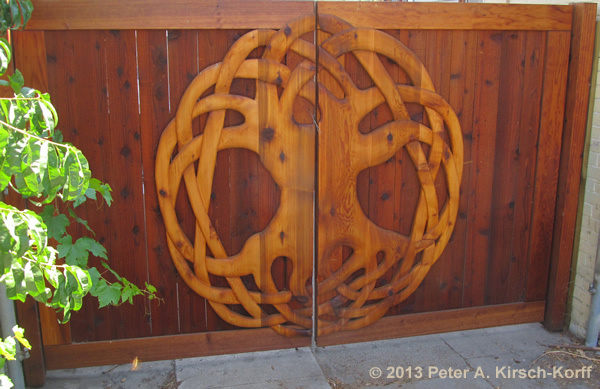 My online portfolio features photos of my gates for driveways, entryways and gardens. To see more details about a project, just click on a photo. As a first step, I recommend that you look at lots of different gates to discover what you do and don't like. 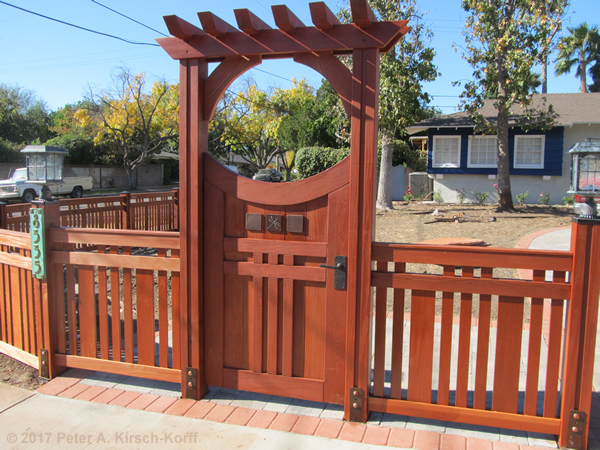 You can mix and match design ideas and functionality to create the perfect gate. So take a look at the photos below and online. If you see what you want (or something close), we can use that as a starting point for a client inspired design. For even more design ideas, check out the resources below. Then read over my design guide to get a really good idea of what you want, and the budget you want to spend. When you are ready to get started, contact me and we can set up an appointment to tour your location, discuss design options and establish a budget, so I can give you a detailed estimate. 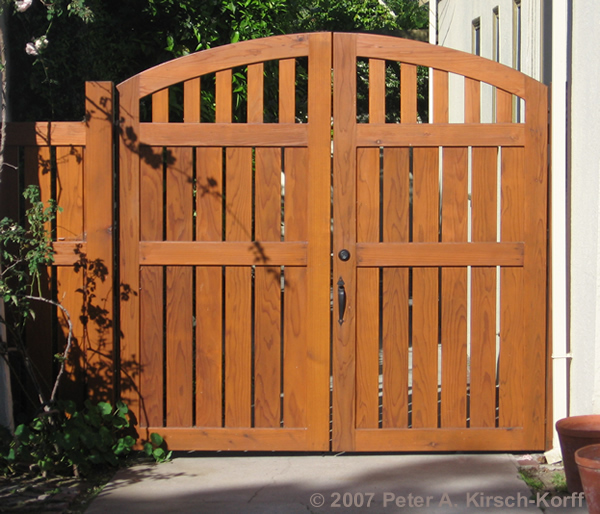 The prices below are for well built wood gates that look good and function for years. 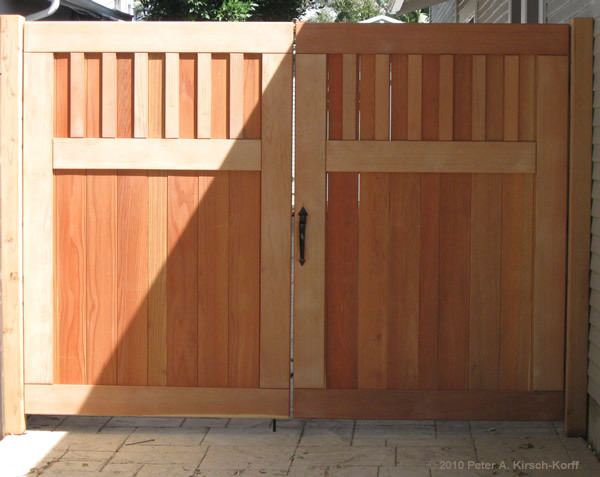 Unfortunately, not all wood gates are built well, and it can be difficult for a layman to tell the difference between a well built gate and one that will start having problems in a few years. Good quality material and hardware, combined with superior building skills, make all the difference. 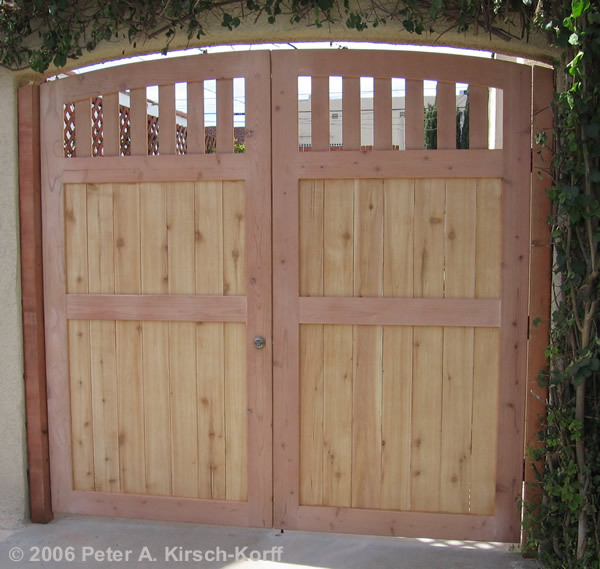 The cost depends on the type of wood gate you want: basic, custom, or high end. 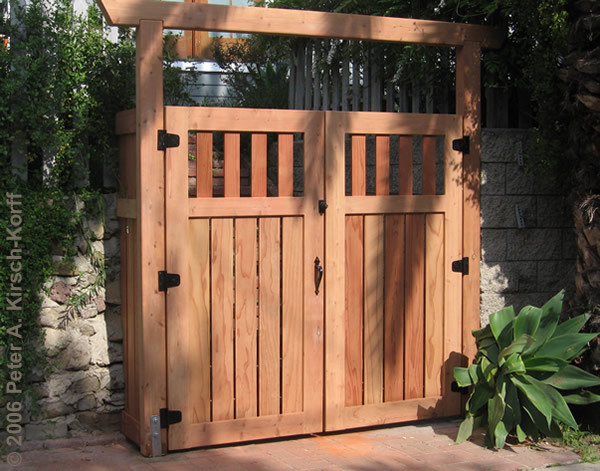 A basic gate is a simple wood structure and starts at $400. 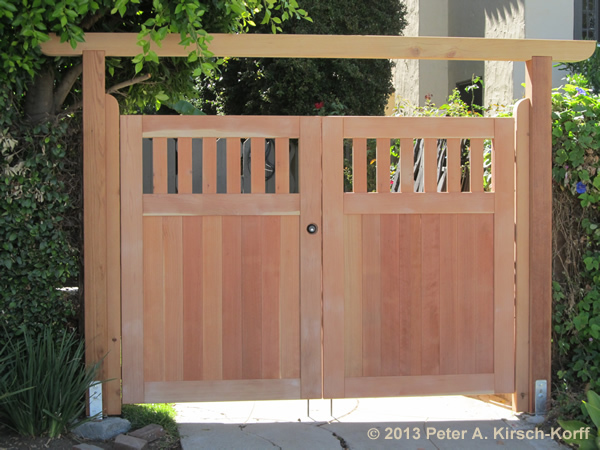 For this type of gate you want to find a basic gate builder, so please see my related links. 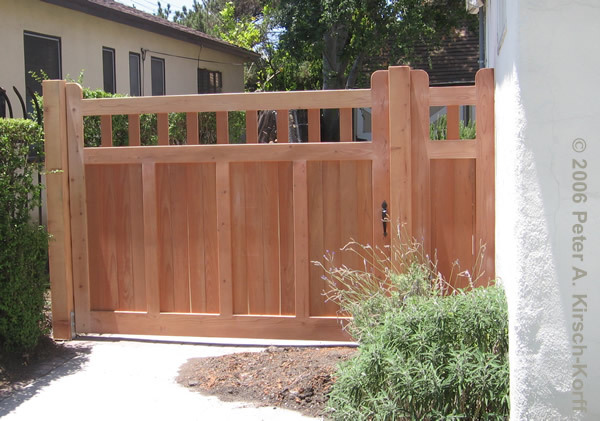 A custom entry gate runs from $800 - $3,000, a driveway gate costs $2,500 - $6,500 and a double gate runs $5,000 - $11,000 You can save money if you have a gate and fence built at the same time, since a gate can be built while the concrete sets on fence posts or arbor footings. Surprisingly, there are builders who charge a lot more. 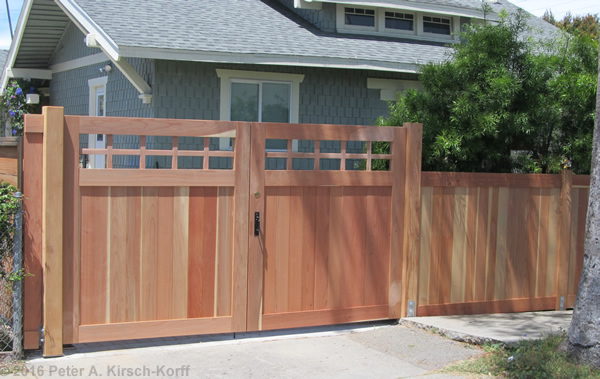 A high end wood gate or pair of gates is an investment in architectural style and high quality construction. 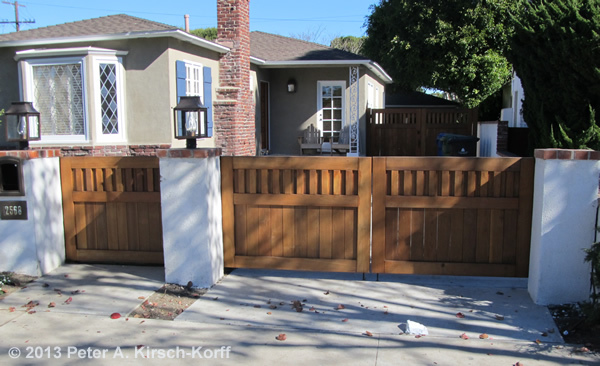 An entry gate starts at $2,000 and a driveway gate starts at $5,500. 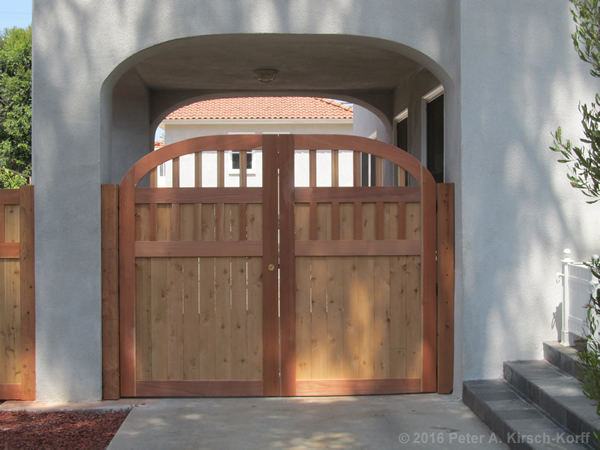 If you are purchasing a pre-made wood gate, remember to include the cost of on-site installation and additional materials (posts, concrete and often hardware) in your budget. You can also read more about comparing estimates. 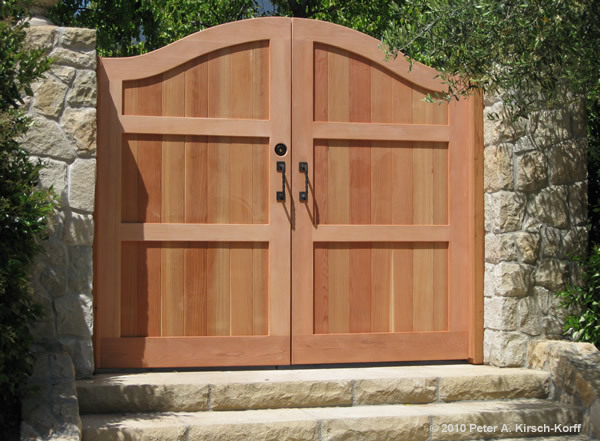 This design guide provides design ideas and information on how to develop a great gate design, select the best location and identify the right wood for your needs and budget. 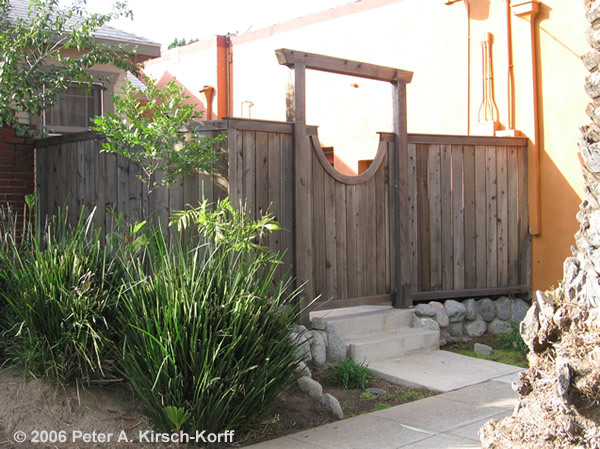 Mediterranean, Southwestern, Spanish & Mission Gates ~ Start with natural wood posts and natural boards. Add in period looking post caps and rustic metalwork hinges to achieve this style. 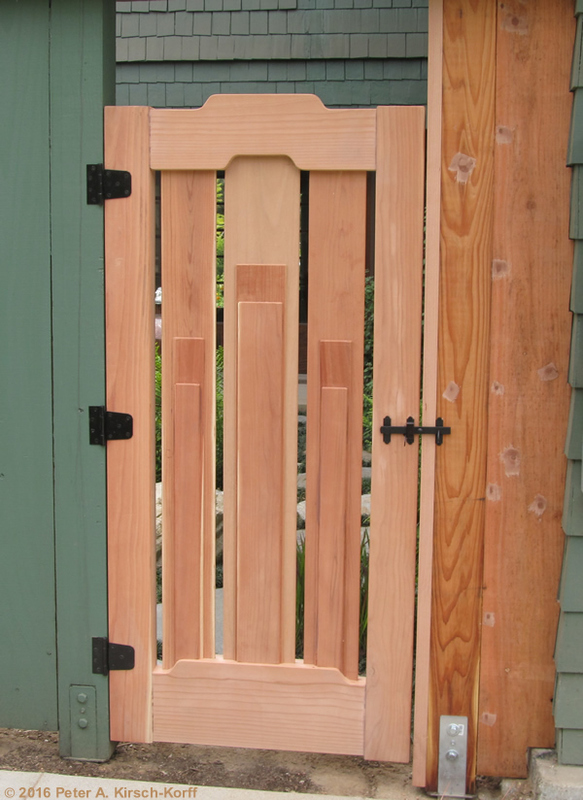 Arts & Crafts, Craftsman & Greene and Greene Inspired Gates ~ At the heart of this style is smooth planed wood assembled using simple, sometimes pegged joints and wooden latches. Additionally, beams with rounded edges, "Japanese" style joinery and the "cloud lift" motif are a mark of the Greene & Greene style. Complete the look by using simple board patterns, trim accents, and copper post caps. 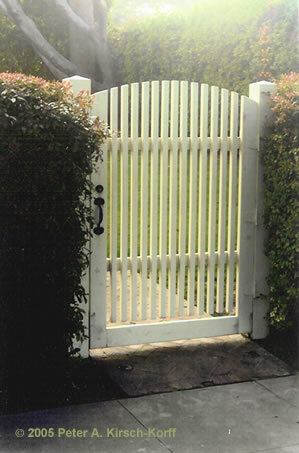 Cottage, Colonial & Ranch Gates ~ One of the most popular gate styles is cottage -- which is a simple looking gate that I like to give a sophisticated feel with vertical accents and arches. The style can be adapted to work well for English farm houses, Victorians and English Colonials by echoing distinctive details in the house architecture -- such as porch railings, eave grillwork or fence details. 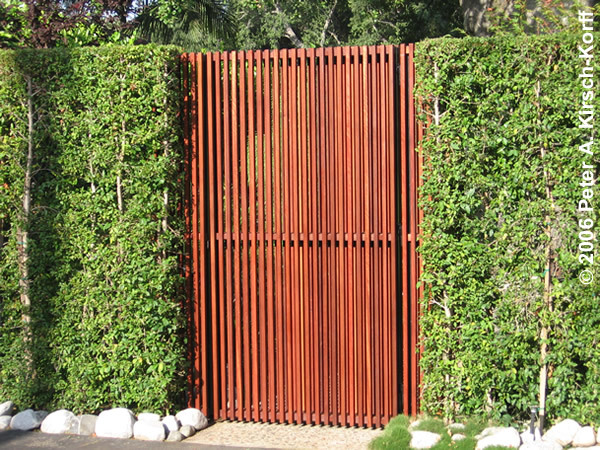 Modern & Asian / Zen Gates ~ Modern and Asian style homes can offer more of a style challenge because the architectural style is so strong that an ordinary looking gate would look out of place. 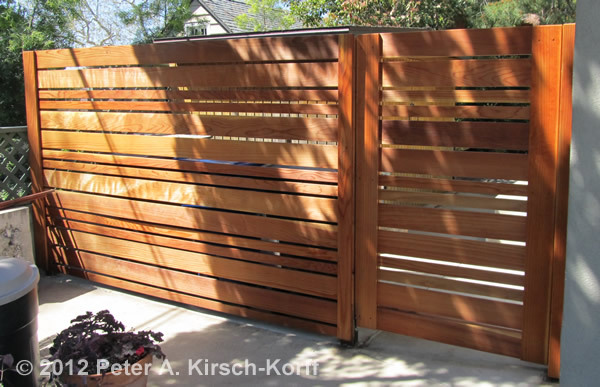 For modern gates, I like to use simple designs which highlight the natural characteristics of the wood along with sleek hardware. 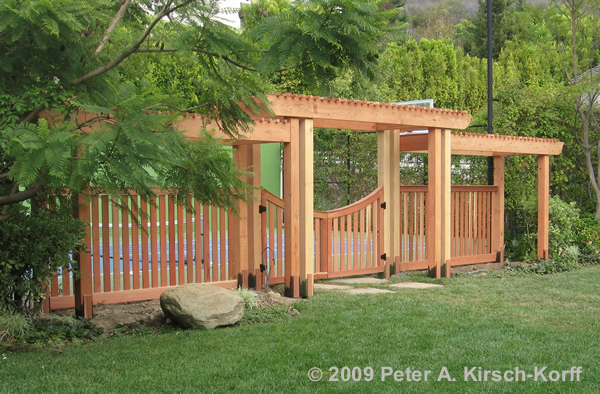 For Asian and Japanese Zen gardens, traditional designs like a half moon gate can create an important focal point and transition into the garden. The overall dimensions should also fit with the proportions of the garden. If your gate arbor is intended to support plants, the size and proportions should be matched to the size, weight and density of the plant. The final color should compliment the colors used in your landscaping and home. 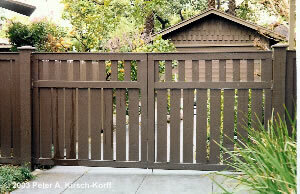 If you want to blend into the landscaping, the natural color of the wood or browns and greens work well. If you want the structure to stand out or highlight nearby plants, strong colors like white or black can be used. 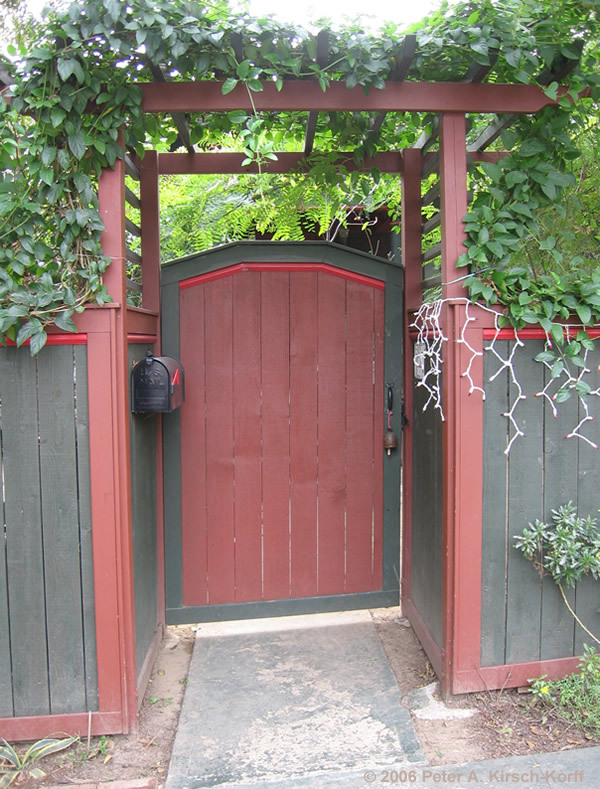 Using the same color and trim details on the gate as on your home will make it look like an integral part of your home. Placement ~ Gates should be placed to work with the natural flow of traffic and the type of pathway or driveway leading to and from it. 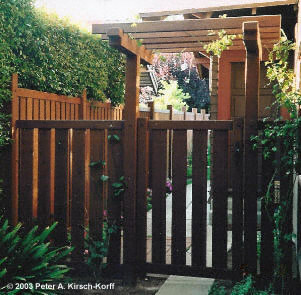 For garden gates, the placement of the gate and the view upon entry should also be considered. Size & Shape ~ The gate and its arbor should be proportioned and styled to fit its surrounding environment of house, landscaping, and fencing. 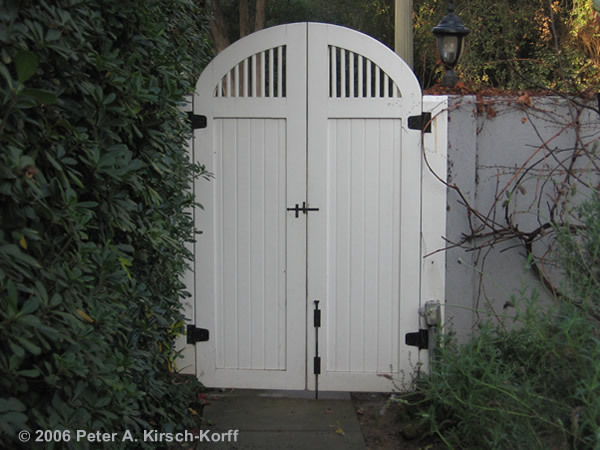 Clearance requirements are determined by what needs to pass through the gate or arch, as well as how often. Consider the size and shape of cars, people, gardening equipment, trash barrels, toys, and lawn furniture. The overall width and height may be determined by existing structures and landscaping. Together, these factors impact the overall design, number of gate panels and construction technique. Wind & Water ~ In areas that experience high winds, a more open design, extra bracing, and heavy duty hardware may be needed. Where excessive moisture (from rain, sprinklers and deep shade) are factors, the gate or arch should be designed to shed rain and dew readily. Ideally, the project should also be placed to dry out well after raining or watering plants. Good drainage away from post bottoms should also be created. 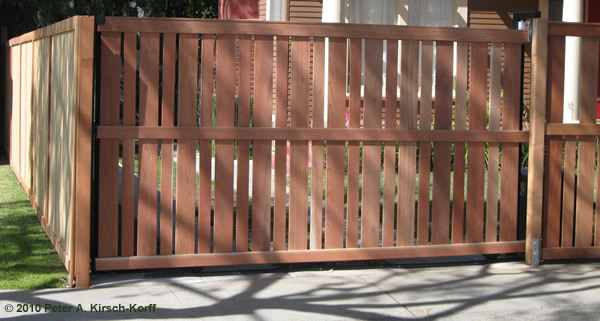 Materials ~ To maximize the life of your gate, the gate frame should be made of appropriate, long life materials. The gate posts should be set in steel column bases. 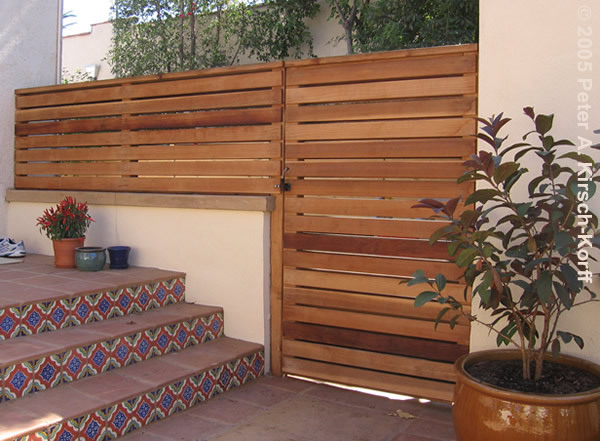 The posts, frame and facing can be made of Redwood, Mangaris™ ( Red Balau), Ironwood (Ipe), Cedar, or other woods. See below for more details. Finishes ~ Heat and light contribute to weathering, so a UV protective finish is very important. If the gate arbor will be covered with hard to remove plants or vines, it is very important to also apply a thorough coating beforehand. Stains (clear, tinted, or solid) and paint are popular finish choices. Hardware ~ False hinges and ornamental iron (such as straps, bolts, and decorative studs) may be added to enhance the appearance and style. Locks and latches are chosen for use, durability and style. 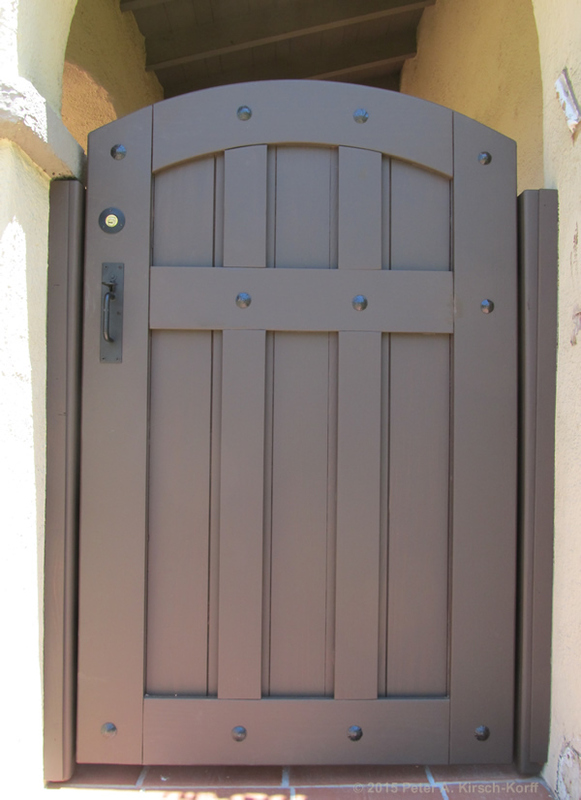 These can range from custom made wooden latches and medieval ironwork to modern house knobs and dead bolts. 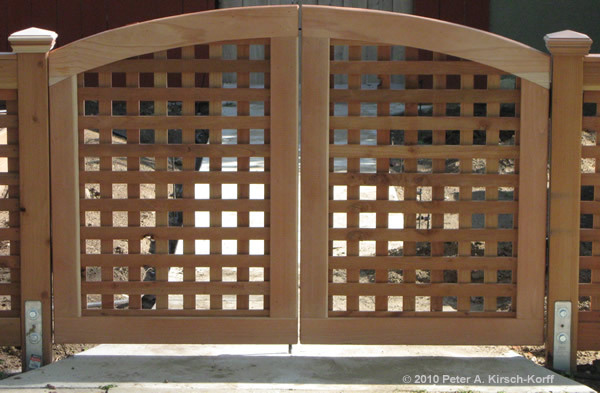 Decorative Design ~ To enhance the design, gates can be curved and decorative gate posts and filler panels added. 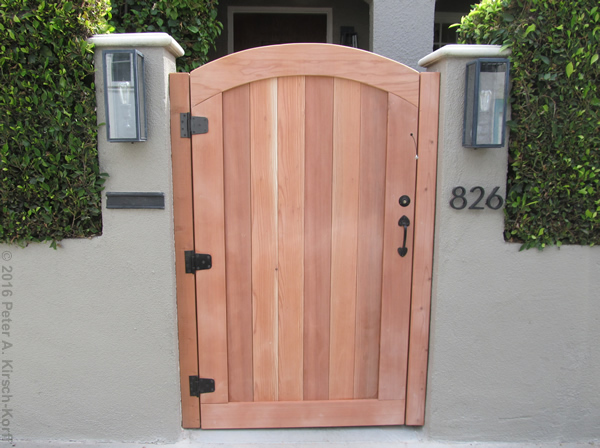 Trim, moldings, lattice, strapping, post caps, and finials add to the uniqueness of your gate. Lighting ~ Light fixtures can add to the style and functionality of your gate to create mood and night lighting. Or to turn it into temporary focal point in the evenings. 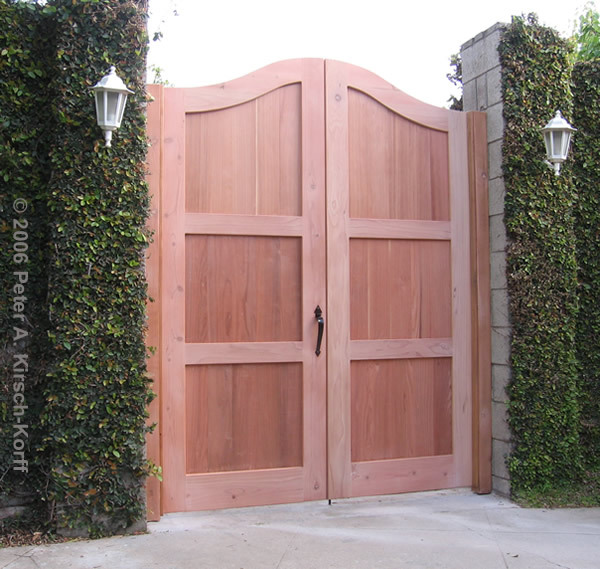 To make sure you are delighted with your custom driveway or entry gate -- you want to choose the right building material. 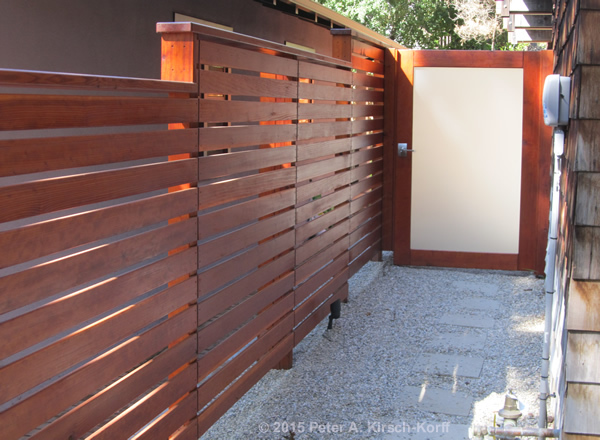 In Los Angeles, the popular wood choices allow you to make trade-offs in terms of cost, quality, color, visual appearance, ease of maintenance and the ability to resist the elements (water, sun and pests). The first type of wood to choose is for your framing -- the structure that holds your gate upright and to which you attach the wood panels or boards. Pressure Treated Wood ~ For hidden framing, I only use pressure treated lumber (see photo). This wood is treated with a variety of chemicals to make it resistant to termites and rot. In the last few years, a major change has been made to the preservatives used -- they are safer for the environment but less effective. Redwood ~ For visible framing, such as gate posts, cross pieces and railings you can upgrade to redwood for a better appearance. There are several popular choices for wood boards. Once you have chosen the boards, I pick the appropriate wood for your trim and posts. 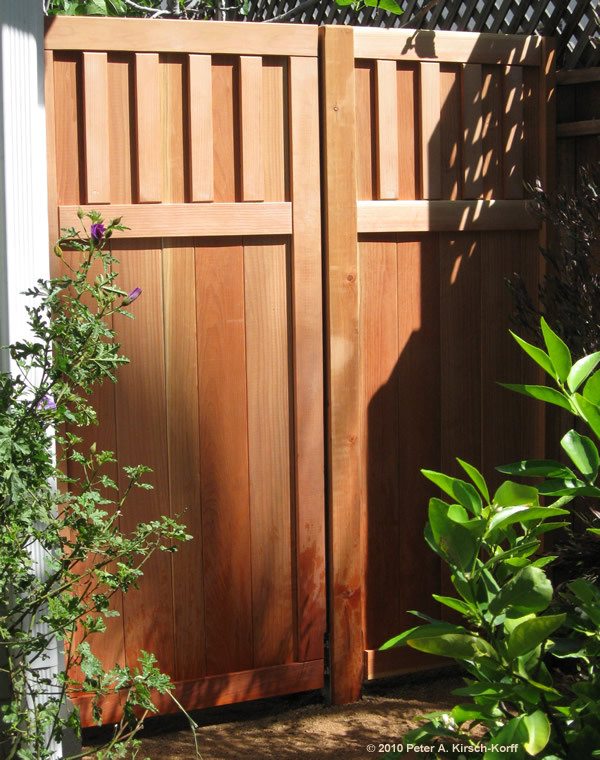 Based on your needs and budget, I can also build gates out of other woods and some composite materials. 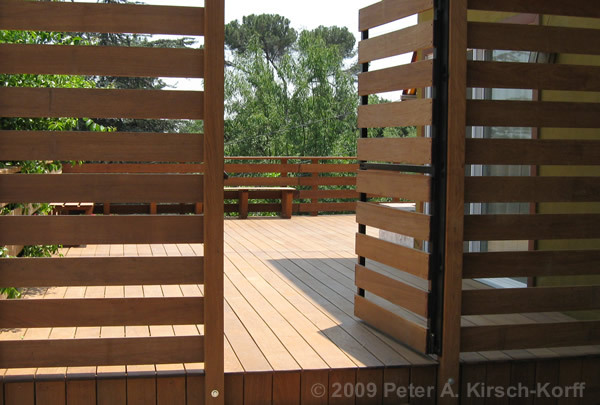 Cedar ~ A soft, golden-tan wood (see photo) that offers good weather and termite resistance. Redwood ~ A distinctive pink/red colored wood which ages to gray. The red heartwood is naturally resistant to damage from termites and moisture. Any white part of a redwood board, known as sapwood, has little resistance to termites and rot. I use Construction Grade Heart Redwood, commonly known as Con Heart (see photo), which has no sapwood and some knots. For trim, I hand select the best clear redwood (see photo) with the least amount of sapwood possible. I can also use more expensive grades of redwood, if your budget permits. Mangaris™ (Red Balau) ~ A dense grained, reddish-brown hardwood (see photo) from Indonesia/Thailand that ages to a silver gray like Teak. It stains up like Mahogany and is more durable than Redwood. See the rich color of the unstained wood (see photo). However, Mangaris™ needs to be treated with oil on all sides of the boards to prevent cupping, to which it is vulnerable. "Ironwoods" ~ A chocolate brown family of heavy and durable South American hardwoods, including Ipe and Pau Lope. They offer excellent termite and weather resistance. However, ironwoods are more labor intensive, more costly and heavier, which means you need a stronger support frame. If you need ideas and inspiration, check out the resources below, clip magazine pictures, look through your vacation photos and keep an eye out for what you like in the neighborhood. The more you know about what you like and don't the easier it is to create and build something you will be delighted with for years to come. Here are a few books I recommend. This book has over 300 color photos to give you lots of ideas about fences and gates and finding the style and purpose that fits your needs. 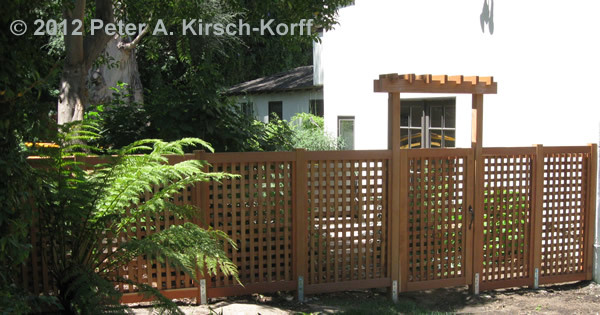 This book features many inspirational photos and ideas for gates, fences, trellises and more. I also recommend checking out these online resources for more ideas. You can search the image archives at Google Images, Yahoo Images, MSN or your favorite search engine to find inspiration from architectural showcase homes, historical buildings and DIY projects. 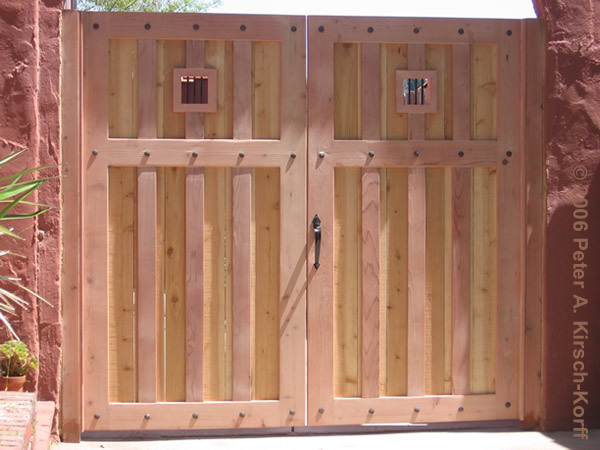 Unfortunately, since I build everything on site, I can not build and ship you a driveway gate, entry gate or garden gate. 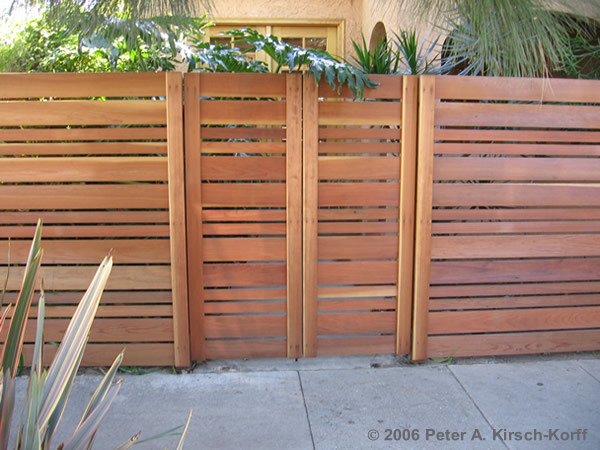 If you need an automatic residential wood driveway or entry gate in Los Angeles, you might try these two sources. I haven't had a chance to work with them, so let me know what you think of them. 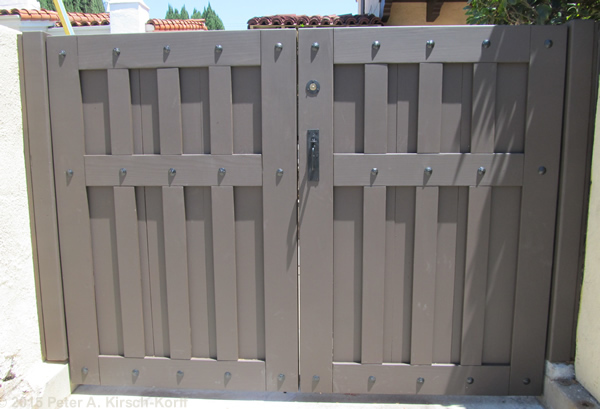 These electrical gate specialists build and service all types of custom residential gates. 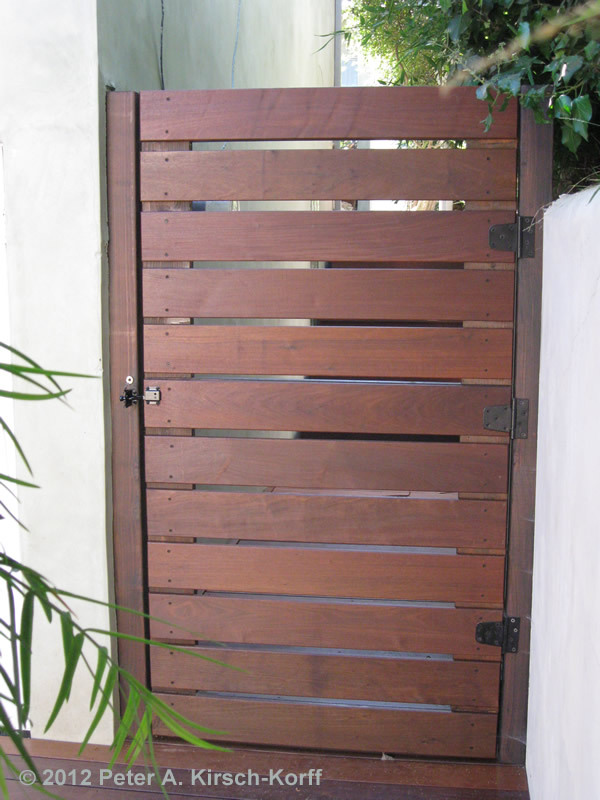 This company designs and manufactures custom automatic gates.